Cravings Book Giveaway Winner Announcement! I just wanted to write a post and thank everybody who visited this blog last Wednesday for Mary DeTurris Poust’s blog tour. We got some really great comments, and even if you didn’t comment we hope that you truly enjoyed the interview! It was a pleasure to interview Mary and to be able to share some information about her new book and inspirations as an author with all of you. As promised we ente red all the names of those who commented on the interview to be given the chance to win a copy of Cravings: A Catholic Wrestles with Food, Self-Image, and God. We decided to go with the old fashioned method of writing the names on a piece of paper and drawing from a hat. Our lucky winner was a commenter named Nancy Ward! We are very thankful for all of the comments that were left on the interview. If you didn’t win and still would like a copy of the book, you can find it on Amazon here. 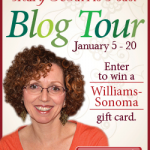 I also wanted to thank Mary DeTurris Poust for including My Catholic Blog on her blog tour. It was a true honor to be a part of something, and Mary is such a wonderful person! You can (and should) visit Mary’s blog Not Strictly Spiritual often for more updates from her. Previous ArticleAre You Best Friends with Your Siblings?